Did I say we would be leaving Mazatlan Thursday or Friday? How adorably naive. A friend yesterday asked when were leaving Maz, and that is what I said, Thursday or Friday. We had just a few things to do, then off we would be! Let's review today's plan as of coffee this morning. The guys from the yard would be by today to install the autopilot ram. Order purified water from the marina. Maybe go food shopping (ha!). Just a bit of background, and then I will tell how the day really went. A day or two ago Kristen said she was a bit stressed on the boat about being so stingy with water. 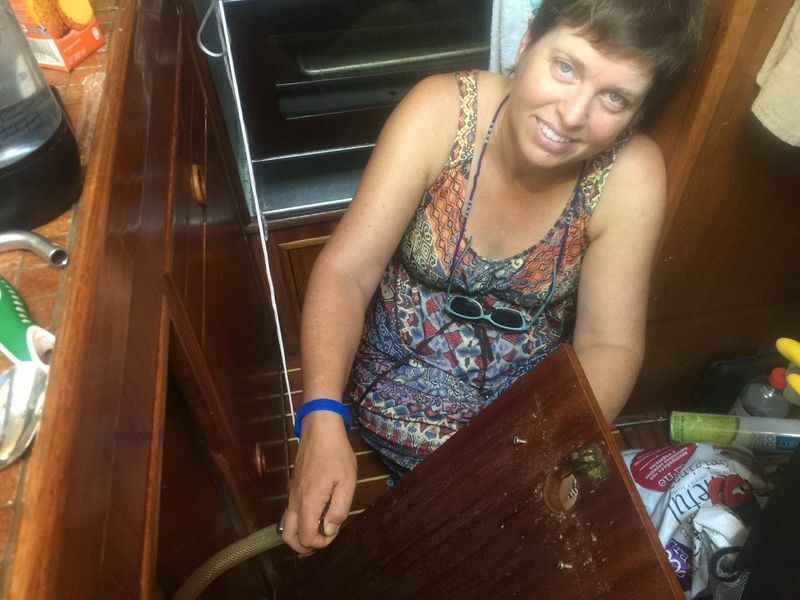 One partial solution is to have salt water in the galley, a common configuration for boats. We do not have a salt water in the galley, so we use fresh for everything. We do however have a salt water through hull in the galley, but no pump for it. It was pretty low on the todo list in Seattle, but I had purchased a manual foot pump and a spigot, with the intention of installing them someday. I even spent a solid half hour planning out the install with a friend in San Diego before we discovered I needed a bit of extra hose that I didn't have. I found the hose in La Paz, and then all that remained between us and salt water in the sink was time. So, with Kristen's comment yesterday, I gave it some more thought and two minutes later plus a stroke of brilliance, I had taken over the manual fresh water pump and made it salt. Problem solved. Well, it was a compromise. 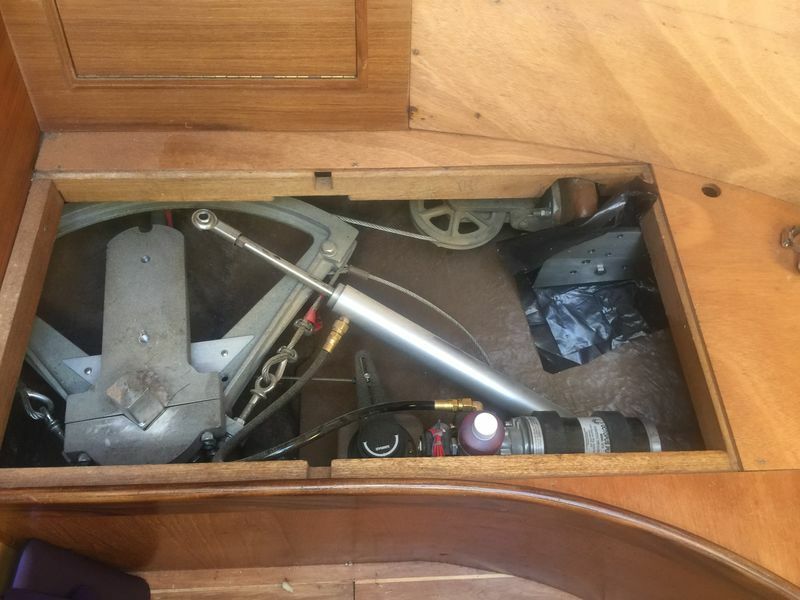 The foot pump would have been better, but I didn't have the right tools to make a neat cut through the teak in the galley through which the pump foot pedal would extend. With another stroke of genius, last night I emailed the yard owner who was to be installing the auto pilot today asking if he could bring a special type of saw to the boat so I could install the foot pump. The guys from the yard showed up today with the autopilot and a saw for me, and an hour later, maybe two, I had the foot pump installed. But for some dumbass reason, since the under-the-sink was opened up with the install, I gave the fresh water line that attaches to the electric pump a good shake and snap!, I cracked a little plastic strainer that is attached to the pump. I cannot seem to resist pulling and poking things that probably should not be poked and pulled. Since our tanks were low, water just dribbled onto the floor instead of a more steady stream, I cut the power for the pump, and took off the strainer to see what had happened. Sure enough, I busted it. I have become quite proficient at breaking water pumps. Now, as luck would have it, Kristen was very successful with arranging to have purified water delivered to the boat in five gallon jugs. With perfect timing, the guys were filling the mostly empty tanks, the water level rose higher than my input hose, and water started spurting out of the now disconnected hose. What's a guy to do, but stick his finger in the tube, which is what I did, and then attempt to tell the water guys to stop pouring in more water. "No mas agua, no mas!" No shutoff valve exists that I know of, so I just sorta stood there, stooped over the hose trying not to spray water all over the damn place. Kristen took over this all important job so I could fish around for our spare strainer. It was in the fourth place I looked, not too bad. I removed the old teflon tape from the threads on the pump, wrapped new stuff around the threads, always a mental challenge for me, while essentially standing on my head (it's a boat), and screwed on the new strainer. As expected the strainer looked like it would take the hose, but after spraying about a gallon of purified water all over me and the boat trying to get the hose over the strainer, I admitted defeat, not quite sitting or standing with a finger in the hose like a dumbass. So here comes Rick from the yard, takes a look all around with the damn dogs barking their fool heads off, comments on the lack of shutoff valve and asks, "Where are your needle nose vice grips?". Ah, what? "Hang on" he says, "I've got some. There, instant shutoff valve!". It was pretty ingenious. "Oh yes", he says, "there is no end of uses for needle nose vice grips." Queue water guys to start pouring again. Rick and I ran over to his shop and rummaged through a couple of bins to find the right adaptor for the hose to strainer attachment, and back on the boat I finally managed to get the new strainer installed without a single drop leaked. Well maybe a few. AP ram closer to being installed. Epoxy is curing, the guys will be back tomorrow sometime. We have more or less full water tanks, for which we payed $30 US. Ouch! All of our dish towels are dirty and wet, hanging from the lifelines. Adam successfully made pancakes for lunch. Two days ago, Monday, while discussing with Kristen when we should leave Maz and head south, I mentioned that the best day for leaving was looking like Saturday, from a wind perspective. "Oh I don't want to wait until then", she said. I should have know right there and then, we would be leaving on Saturday. Fancy new AP ram. The hydraultc pump is in the foreground, the ram is laying diagonally, and the new stainless plate where the ram will be attached, top right, is in place waiting for filling epoxy to cure. Kristen being awesome holding back the flood.